When sixteen-year-old Edwin Ruiz sees kids skating through downtown, he recalls his nine-year-old self living in that area, not having any place he could use his skateboard. There was nowhere nearby that allowed skateboards, and his parents wouldn’t let him cross town to the only skate park in Santa Ana, at Centennial Park. Now that he lives closer to Centennial Park, he feels responsible for the downtown kids, who still have no legal, safe place to skate. “I used to be in that position. Now I want to advocate to get [a park] down there, too,” Ruiz said. 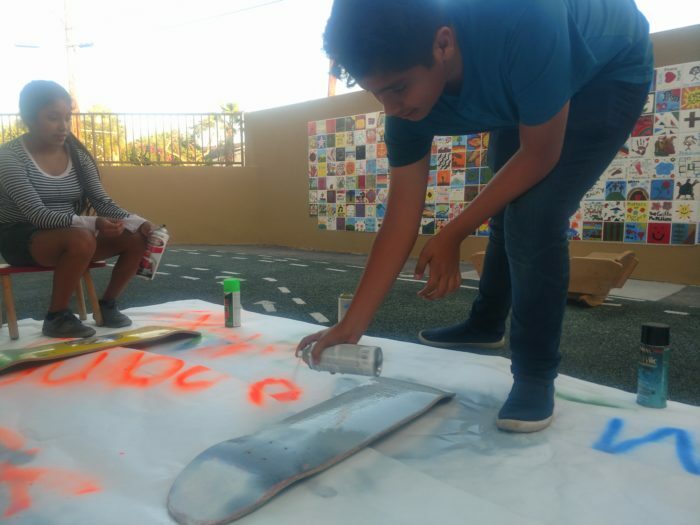 A group of youth from KidWorks, a local nonprofit focused on after-school assistance and youth leadership, has been working for the past two years to make sure skateboarding is included in transportation conversations in the city. The team, Youth for Active and Safe Communities (YASC), has specific tangible goals, including bringing more skate parks to open spaces — Orange County has roughly sixteen free skate parks, one of them being in Santa Ana, plus five that charge fees. But YASC is also working to shift common perceptions around skateboarding. They want skateboard access to be a recognized as an important goal for cities and the state. According to the Tony Hawk Foundation, in 2010 there were roughly six million youth under eighteen years of age—8.6 percent of the country’s youth—who rode a skateboard in the last year. The numbers break down to almost a quarter female and three-quarters male skaters. These are high numbers, especially given the lack of support or interest in skateboarding and the active opposition to it as a sport and a means of travel. In addition to advocating for more skateboarding amenities in Santa Ana, YASC has also joined a bigger campaign through the Equity For All coalition, called the Community Lands in Community Hands campaign. This campaign seeks to protect more than ninety vacant lots from being sold without consulting or benefitting the local community. The vacant lots would be developed based on the community’s needs and desires, and in the campaign’s surveys of residents, two of the top priorities identified were open space and skate parks. While the main goal of YASC is to get a skate park or have skating amenities included in park designs, it also aims to validate skating as a form of transportation. Skateboarding is often lumped into the category of pedestrian travel, which creates the perception that it is not a viable mode of travel, said Mojgan Sami, a public health researcher and lecturer at University of California, Irvine. During the process of creating Caltrans’ recently approved Bicycle and Pedestrian Plan, Sami tried to get staff to define skateboard travel apart from pedestrian activities, so that engineers and planners would be more mindful of it as its own mode of travel, but in the end the final plan kept skateboarding under the pedestrian travel umbrella. Orange County cities have created policies to deter travel by skateboard. Sami, who has assisted in the skateboard campaign for the past year, analyzed skateboarding policies in Orange County and found that, of the 34 cities with ordinances that restrict skating, most focus on prohibiting the activity in downtown business areas. Planners in many of those cities either didn’t know the rationale for the passage of the policy, or cite safety as its reason for existence. When active transportation advocates seek more resources and infrastructure to make streets safer, walking and bicycling are the modes that get the most emphasis, said Maria Ruvalcaba, Youth and Community Engagement Coordinator for active transportation at KidWorks. “We’re just trying to put [skating] on the radar of people who are already advocating for active transportation, and to remind them that skateboarding is a form of transportation, especially for youth,” Ruvalcaba said. Some of the members of YASC joined the group as experienced skaters, but others are beginners. While Santa Ana offers free Confident Cycling classes, there were no public classes to teach safe skateboarding habits or skills like how to stop, start, turn, or safely land from a fall. So YASC partnered with Basics of Skateboarding Skate Camp and OC Ramps to create a how-to-skate class. Basics of Skateboarding offered an instructor to teach the class, and OC Ramps hosted the workshop at their skating space. YASC has succeeded in getting its agenda on the city council’s radar, but the needle has yet to move in a dramatic way. The Community Lands in Community Hands campaign has been active for a year, but the city council has been reluctant to donate or sell any of its lands to the newly established Community Land Trust, called THRIVE Santa Ana. Unfortunately, delays in city policy can lead to youth walking away from their boards. Evelyn Torres, 14, has been with the group since she started skating two years ago. She said she got involved because a lot of her good friends skated, and she felt that no one was advocating for them. “Our biggest goals is to get a skate park in Santa Ana and just to live a healthier lifestyle,” Torres said. Delay in finding park site underscores key dilemma in disenfranchised communities: how to ensure a location is one that local residents can actually access. Orange County received $4.1 million from the CDC to support government, education, and nonprofit entities working in Garden Grove, Santa Ana, and Anaheim on disease prevention. The projects that came out of these partnerships ranged from traditional—nutrition education and physical activity promotion—to boldly forward-thinking—funding the installation and design of a bicycle boulevard.